At this point, the main issue has to do with moving on to more detailed and focused treatment of your patient’s issues. 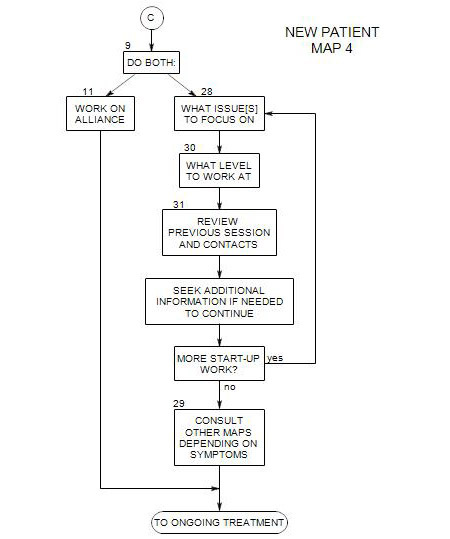 As in the other maps, there is a specific concern with your working alliance with the patient [Section 11], shown at the top of the map, and carried throughout. Section 28 considers the issues to focus on. Section 30 discusses the level you choose to work at. You can review previous sections and contacts [Section 31] and seek additional information if you need it at this point. Then Section 29 refers you on to other maps for the treatment of specific issues.